Unsere Internetseite verwendet Cookies. Indem Sie weiter auf unserer Website navigieren, stimmen Sie der Verwendung von Cookies zu. Mehr Informationen finden Sie in unserer Datenschutzerklärung. > Hospitals in Germany – An Underestimated Property Insurance Risk? Hospitals in Germany – An Underestimated Property Insurance Risk? There are frequent reports in the media about fires and water damage in hospitals. On 30 September 2016 a patient on the sixth floor of a German hospital poured disinfectant over herself and set herself on fire. A short time later, the ward was on fire. The patient and another person from the room next door died in the disaster, and seven more people were seriously injured.1 The estimated property damage was in the region of EUR122 million. In addition to fire, water damage often causes spectacular damage worth millions of euros.3 Building defects, burst water pipes, roof leaks, and facades that let in moisture, are just some of the frequent causes of major water damage, resulting in projected renovation expenses that are sometimes in excess of new construction costs. Insurers have been observing an ominous trend for some time, raising the question whether they might be underestimating the risk presented by hospitals. This article examines the current situation facing insurance companies and discusses possible concepts for protective measures as well as underwriting recommendations. Some years ago, a study covering the period between 1980 and 2001 determined that a hospital fire occurs at least every 14 days in Germany.9 Unfortunately, more recent reliable data about hospital claims is not available. Although the Federal Association for Technical Fire Protection (bvfa) in Germany creates a list of registered hospital fires, this is essentially based on media reports.10 This industry association recorded seven fires in 2016, 24 fires in 2017 and 26 fires in 2018 (as of 10 July). In addition, risk statistics released by the German Insurers’ Association (GDV) provide another source of information, compiled from member companies in an anonymous form that presents data and results about the claims history for various risks, specifically fire, water damage, storms and hail, and burglary.13 From this, it is possible to gain some insights for hospitals, as outlined in Figures 1-9. In 2016 approximately 4,100 fire insurance contracts were registered in Germany. In the period under review, 1981 to 2016, the average insured sum (IS) increased continuously. The claims reflect a slight increase in the average amount of compensation, with a noticeable peak in 2016 resulting from major damage to a German hospital (see Figure 1). 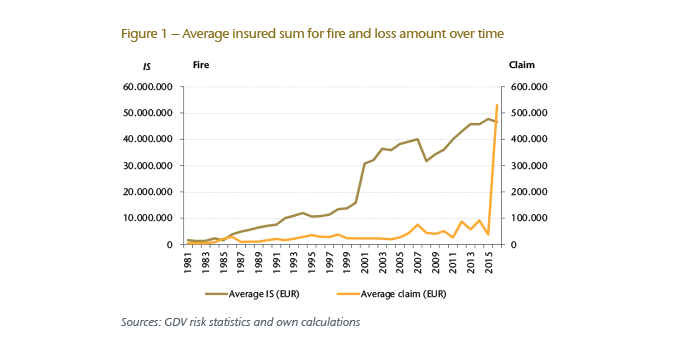 Turning to the probability of fire damage claims in Germany (the number of claims observed divided by the number of insurance policies), it can be seen in Figure 2 that the value varies between 5% and 13% with an average of 8%. By examining the expected claims burden for the same period in Germany (also known as the claims rate, a ratio based on registered claims and insured sums), we see that there is an average expected financial loss in the region of around 0.14‰ of the total value insured. 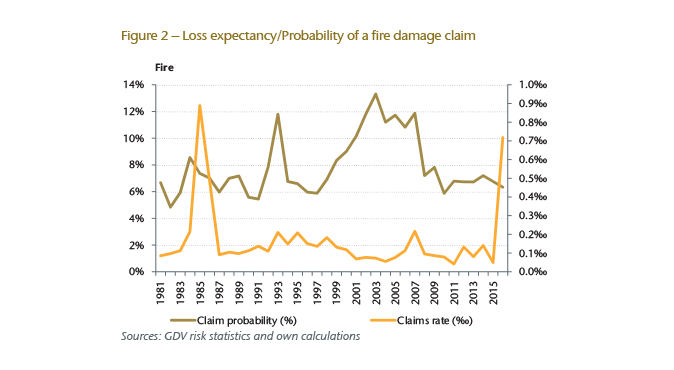 This value is relatively low and, given the probability of a claim, it is an indication that the fire damage to be expected in individual cases is relatively small – with the exception of peaks in years when major damage occurred. Between 2003 and 2017, only 45 cases of major fire damage were registered in total. For each of these, the loss amount was in excess of EUR500,000 and the total claims expenditure amounted to around EUR233 million. 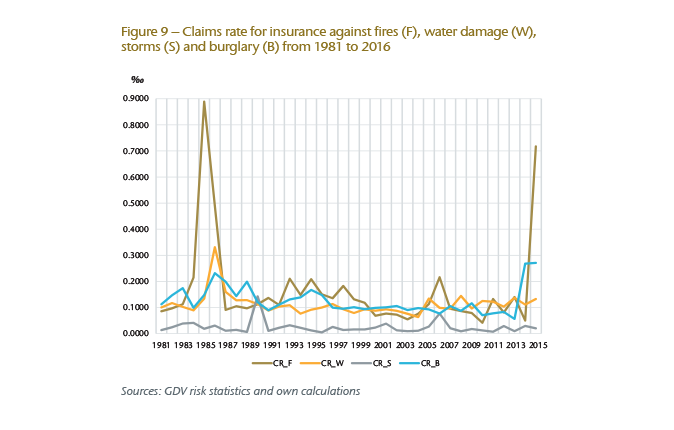 With regard to water damage insurance, the number of policies has declined in Germany since 1987, with the total number of claims decreasing even more sharply. In 2016 only 1,754 water damage insurance policies were registered in Germany. On the other hand, by comparing the development of the average insured sum and average loss amount over time, we see a significant increase for the period under review (see Figure 3). 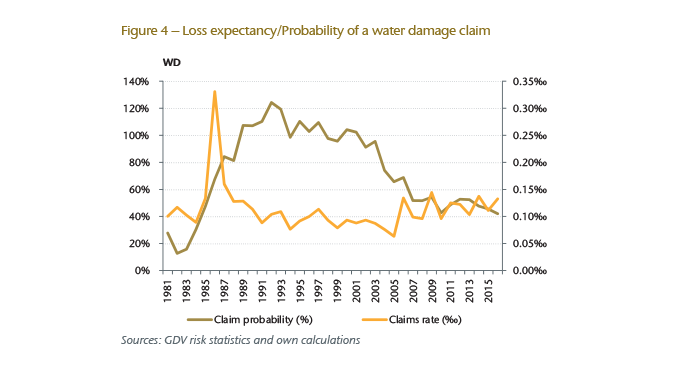 Looking at the probability of claims and loss expectancy in Germany, shown in Figure 4, we see a significant drop in claim probability – to 40% since the early 1990s. However, we also see in Figure 4 a rising trend for loss expectancy to around 0.13‰ (0.10‰ on average for the period under review). 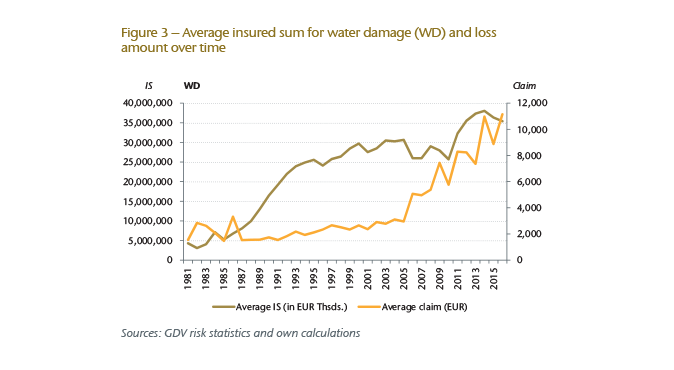 In direct comparison with fire, the probability of claims for water damage is therefore significantly higher in Germany, at 79% on average for the period under review. At the same time, loss expectancy is close to the level recorded for fire damage, at 0.1‰. In the period from 2003 to 2017, 35 incidents of water damage were reported with a total claims expenditure of around EUR58 million. The amount of damage was in excess of EUR500,000 in each case. 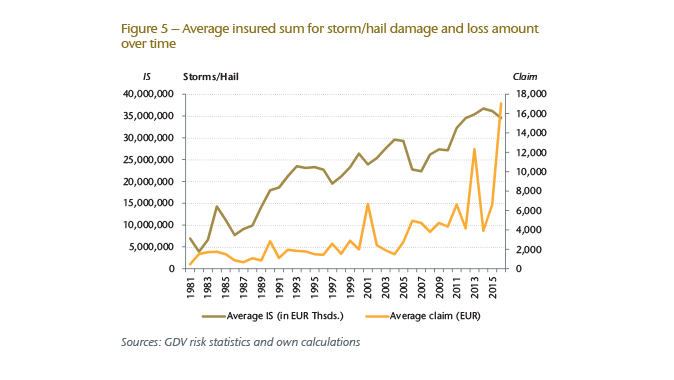 With regard to insurance against storm and hail damage in Germany, both the number of policies (2016: 1,695) and of reported claims have declined over the years – although here, too, there has been a significant increase in the average insured sum and loss amount (see Figure 5). 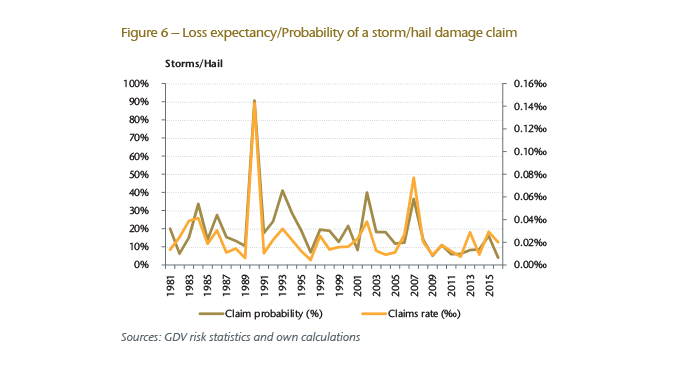 Overall, the probability of claims is in line with the familiar pattern of harmful storm years in Germany, whereby loss expectancy has increased in recent years and is much more volatile. The average probability of claims damage over the entire period under review is about 19%, while loss expectancy is about 0.02‰ (see Figure 6). The number of policies against theft and burglary in Germany has remained almost the same over the years with some variation (2016: 2,012 policies). However, the average insured sum and loss amount have increased almost continuously (see Figure 7). 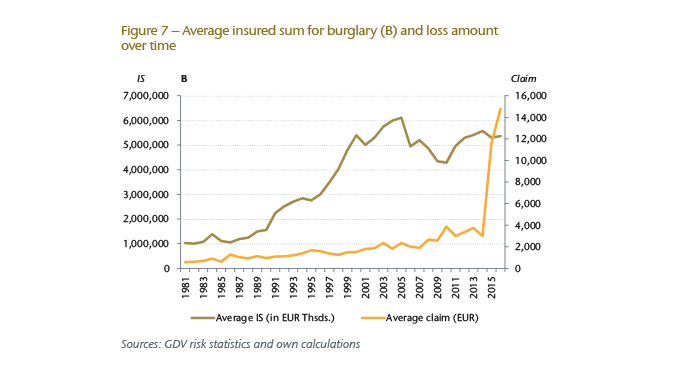 Figure 8 shows that the probability of claims for burglary in Germany has decreased steadily, reaching around 10% in 2016 (around 22% on average during the period under review). However, loss expectancy has increased dramatically in the last two years following a fairly stable period, reaching approximately 0.27‰ in 2016 (0.116‰ on average during the period under review). In summary, this analysis indicates that the frequency of basic losses, in particular, is actually relatively high in Germany. The large number of claims ultimately leads to a significant claims burden with respect to hospital policies, even though the average loss amounts are relatively moderate with the exception of major losses, which do occur from time to time. A particularly striking observation is the frequency of claims relating to water damage. 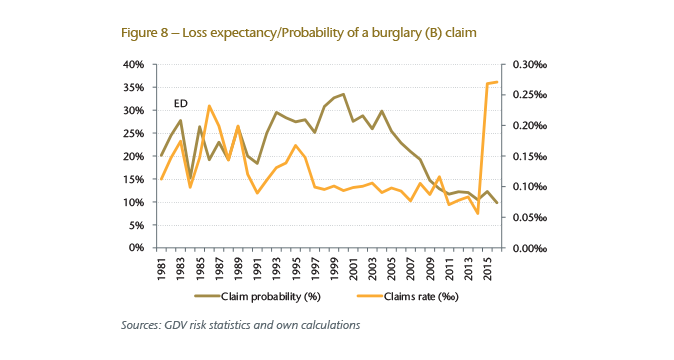 Looking at a summary of each claim rate over the period from 1981 to 2016, we see a relative constancy over the years with significant spikes for fire damage in 1985 and 2016 due to major damage as well as a peak for burglaries in 2015-2016 (see Figure 9). In other words, claims rates for hospitals in Germany have not changed significantly in recent times compared to other types of organisations. This is certainly linked to the fact that no major shifts have taken place regarding the prioritisation and implementation of preventive risk management measures in hospitals – unlike in production companies, for instance, where it is clear that a significant effort has been made to improve risk management over the years. The most likely reason for this are the assumptions that hospitals will rarely experience loss on the one hand, and that budgets in many hospitals have been tight over the years – assumptions about loss and budgets that did not bear out with marked improvement to date. Turning to other countries, an average of around 1,130 cases of fire damage occurred in hospitals each year in the U.S. between 2011 and 2015,15 and the loss amount exceeded the value of one room in about 4% of cases. In the UK, 3,648 cases of fire damage were reported in 2015,16 while 819 cases of fire damage were reported in South Africa between 2003 and 2015 with an average claims expenditure of around EUR13,000.17 Figures for other countries could not be obtained, despite a considerable effort to gather data. From discussions with colleagues in the industry, however, there is evidence of a high frequency of claims in countries, such as the Netherlands, with regard to insurance against fire and water damage, and this has prompted individual providers to withdraw from the segment, with others following suit. In Scandinavia the key areas of larger hospitals (wards, technical rooms, examination rooms and operating theatres) are usually protected with sprinkler systems, according to our findings. In the UK, France, the Netherlands and Poland, the standard of protection in hospitals is low: as in Germany, there is no obligation to install automatic fire extinguishing systems. Taken as a whole, a hospital is an extremely complicated and high-tech entity. A hospital generally consists of a series of interconnected buildings that are linked together in various ways by corridors and tunnels. From a fire safety point of view, such a design is treated as one large, coherent building complex. Hospitals are very efficient when processes run smoothly. However, if there is a disruption (e.g. fire or water damage), the vulnerable nature of a hospital can be seen very quickly. Especially if a problem affects one of the many areas prone to bottlenecks (e.g. a ward, intensive care unit, operating theatre or central infrastructure), the result may soon be disruption on a massive scale or even the total suspension of operations. Increasingly, hospitals are focusing on issues of efficiency and profitability. As a result, statutory revenues are no longer sufficient in some cases to cover growing operating expenses, including the rising costs for essential investments. This has already led to an investment backlog in the past, especially for older hospitals. 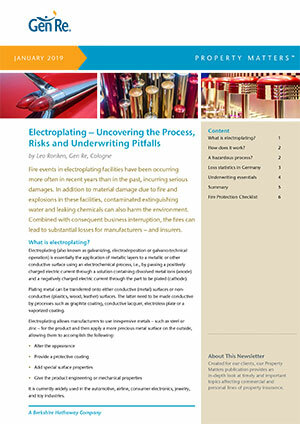 In order to fend off competition and to be attractive to patients, the available funds for investment have flowed into technical and medical modernisation programmes rather than risk management measures.19 From an insurance perspective, the increasing use of sophisticated technology increases the financial burden as well as the vulnerability of systems and rooms together with the claims expenditure in the event of fire or water damage caused by indirect or direct exposure to flames, increased humidity, mould and so on. All of this means that many hospitals in Germany have some catching up to do in order to minimise risks that have grown in recent years. Preferred underground location of areas for diagnosis and examination as well as laboratories, surgical areas and the hospital pharmacy due to the weight of equipment (maximum floor load per square metre). In addition, central technical systems and utilities that are essential for the smooth running of a hospital are usually concentrated below the ground floor. However, it is not only fires that can lead to a major loss: there is also a significant possibility that damage caused to or by water pipes and systems may have the same result, especially as such damage is often only recognised after a considerable delay, during which time important technical equipment and structural areas may already be compromised. Generally speaking, renovation or restoration of the affected rooms is only possible under difficult conditions – specifically with continued hospital operation, taking into consideration the necessary hygiene requirements. There are constantly cases in which it appears ultimately more affordable to replace the area affected by damage with a new construction. Additionally, the replacement of central systems and facilities can lead to significant delays in hospital operations due to extended delivery periods. As the above analysis of claims data shows, there are relatively few incidents of major damage in hospitals. A more problematic issue is the large number of minor claims, especially with respect to fire, water damage and burglary, all of which create a burden for the insurer concerned when taken cumulatively over a year. If unpredictable major losses are then added to this considerable basic burden, the insurance result will soon be negative – especially because significant price competition has led to falling premium income in this segment over recent years. On the one hand, hospital management teams must be made aware of the need for a tailored risk management strategy that takes current risk exposure into account. On the other hand, insurance providers should no longer consider hospital risks to be “simple” in nature, but adapt their underwriting and pricing in line with the respective risk exposure. In Germany there are no standardised minimum fire safety requirements for hospitals, which means that different regulations are in place in each federal state. To improve the loss exposure situation in hospitals, which is not satisfactory at present, a range of appropriate technical measures could be taken to reduce existing risks and to limit the consequences of a loss event. Effective protective measures for individual threats are set out below. Sufficient capacity of water pipes and systems as well as wastewater facilities of suitable quality for use in the hospital sector, taking into account the latest technical regulations and, in particular, the specific challenges of acids, alkalis, wastewater, etc. In principle, the underwriting and pricing for a hospital insurance policy should be based on a recent inspection report carried out by an insurance engineer. In addition to the risk of fire, there should also be information concerning the risk exposure with regard to insurance against water, storm and hail damage as well as burglary and natural hazards. Such an inspection should be repeated at regular intervals (e.g. annually). Any deficiencies identified during inspection, from lacking extinguishing systems or an inadequate water supply for firefighters to ineffective fire protection partition walls, should be properly corrected in a timely manner and reported by the policyholder. Special attention should be given to the level of cover provided, and whether the insured sums are up to date, because new construction projects, conversion work, reorganisation and new acquisitions throughout the year can result in significant changes. The risk of business interruption (BI) should no longer be considered as a supplement to Property insurance in the context of risk assessment and pricing.22 Instead, it should be taken carefully into account both when assuming risk and later underwriting risk. Agreed maximum compensation – Is this final or can it be exceeded through first loss positions? Agreed excesses – Are they suitable to effectively limit claims payments due to high-frequency claims? An analysis of claims shows that hospitals are not “simple risks”, but that the frequency of claims in particular for various types of insurance can lead to a significant claims burden in any given year. If there is also a major loss event, the profitability of the insurance policy concerned or the entire hospital portfolio will generally be negative. Preventive risk management measures to minimise damage and its consequences are rarely seen in the hospital sector due to a strained financial situation for many years. There is a lack of legal and building regulation requirements in Germany, which means that no fundamental changes can be expected in the future with regard to risk exposure and profitability. At the same time, the current rate competition for hospital insurance is set to continue, not least because the financial resources of hospitals will hardly improve. 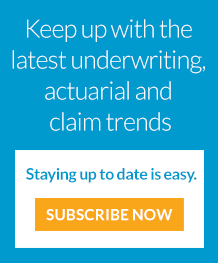 In this respect, the underwriting practices of individual insurance providers are of particular importance: the profitability of individual risks should be pitched in accordance with the facts outlined above and after close consideration of the anticipated frequency of claims as well as the possibility of a major claim. Download PDF Version for Endnotes and Further Reading. Wildfire Probabilities Aren’t What They Used to Be – But What Are They? behandelt Entwicklungen in der Versicherungswirtschaft, die Einfluss auf die gewerbliche und private Sachversicherung haben. © General Re Corporation 2019. Alle Rechte vorbehalten.